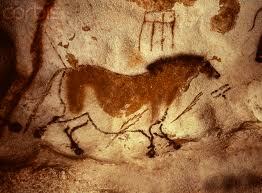 A bit of irony here, since people first depicted horses long ago — now, 30,000 years later, a horse is painting. The painting by the horse is bad, but it’s not the horse’s fault. The horse’s instructor is an amateur artist who’s intent was to gain some fame for the novelty of a horse painting. As an artist of 25 years and as an educator, I can say this horse has a lot of talent but can’t access it because of poor teaching. Whenever I see bad art, I always look at the instructor. So remember it’s always important to find a great teacher if you want to make art that will bring out your natural talent, otherwise you can make bad art and not even realize it. Hands-down, humans 30,000 years ago were better artists than this horse, just based on this example above. But remember it’s not the horse’s fault. Ruth Teitelbaum, an art educator (look at her post), noticed an authentic style in the cave paintings as well. The style of “early human” contains a raw quality to its expression, and that is what makes it good. If we look at the intent behind cave painting artists, we will find that they were not making “art.” They did not have written language, so they had no developed concept of “art.” The difference between these artists above is that one was making quality work and the other is not. The one who was not making “art,” hands down was a better artist. 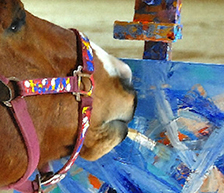 The horse is also not making “art”; however he is the tool of the amateur artist, whose intent is to make art. So intent is a very important ingredient, otherwise you come off with these Jackson Pollock mimics. The question now is what are horses really able to do? Do we limit a horse’s potential because it’s of another species? Have we in fact limited them by breeding? Do we breed their wildness out of them? Or will they become extinct in 30,000 years like many other animals on the verge of extinction now? By breeding-out horses’ wildness, do we in fact breed out their wild creativity, which is vital (and viral) for creative activity? Modern culture has a way of breeding-out the wild instinctual nature that is creativity. In 30,000 years, if the conditions are right, what will horse-kind create? Will horse-kind create a Mona Lisa or a Guernica? Please don’t stop following this thread on horses; you will find it interesting… and stimulating. Next, week’s post will look at the natural tendencies of horses. I’ll then ask horse owners or horse lovers to participate in a discussion. ← Can animals make art?